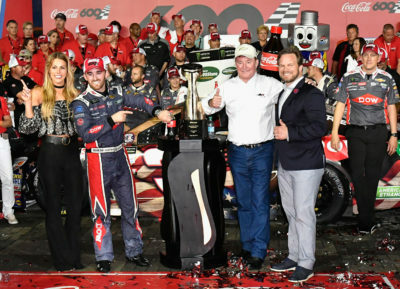 From 22nd place Car 3 Austin Dillon DOW Salutes Veterans Chevrolet won the 58th Annual COCA-COLA 600, his first win in 133 NASCAR Monster Energy Cup Series races. This is his 1st win & 2nd Top 10 finish in 2017. 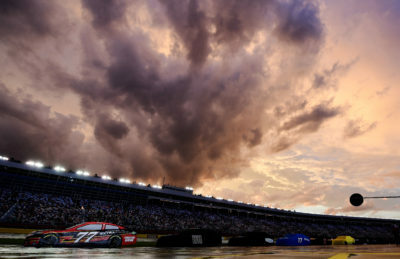 This is his 1st win & 2nd Top 10 finish in 7 races at Charlotte Motor Speedway. 2nd Place Car 18 Kyle Busch M&M’s Red, White, & Blue Toyota, started from 2nd place posted his 16th Top 10 finish in 27 races at Charlotte Motor Speedway. It is his 6th Top 10 finish in 2017. 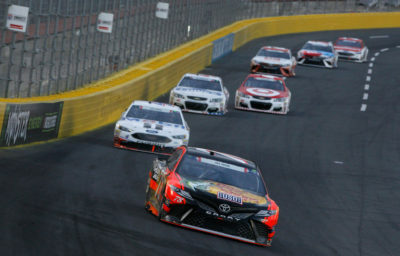 3rd Place Car 78 Martin Truex Jr. Bass Pro Shops/Tracker Boats Toyota, started from 8th place posted his 8th Top 10 finish in 24 races at Charlotte Motor Speedway. Kevin Harvick Mobil 1 Ford, started from pole followed by 9th place Car 31 Ryan Newman Grainger Chevrolet, started from 17th place. Lastly in the Top 10 was Car 88 Dale Earnhardt Jr. Nationwide Patriotic Chevrolet, in 10th place, started from 19th place. Martin Truex Jr. leads the point standings by 5 points over Kyle Larson. Associates Ford Incident Turn 3. 5th Caution on lap 202 for Stage 2 Conclusion. 6th Caution on lap 247 for Fluid On The Track From Car 13 Ty Dillon # GEICO Military Chevrolet. 7th Caution on lap 293 for Car 42 Kyle Larson Target Chevrolet Incident Turn 2. 8th Caution on lap 302 for Stage 3 Conclusion. 9th Caution on lap 330 for Car 10 Danica Patrick Code 3 Associates Ford Incident Turn 3. 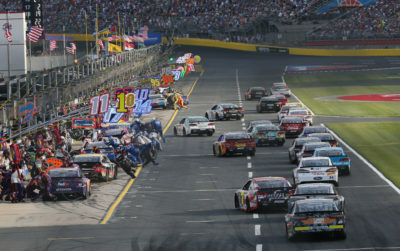 The race had 23 Lead Changes among 10 drivers. 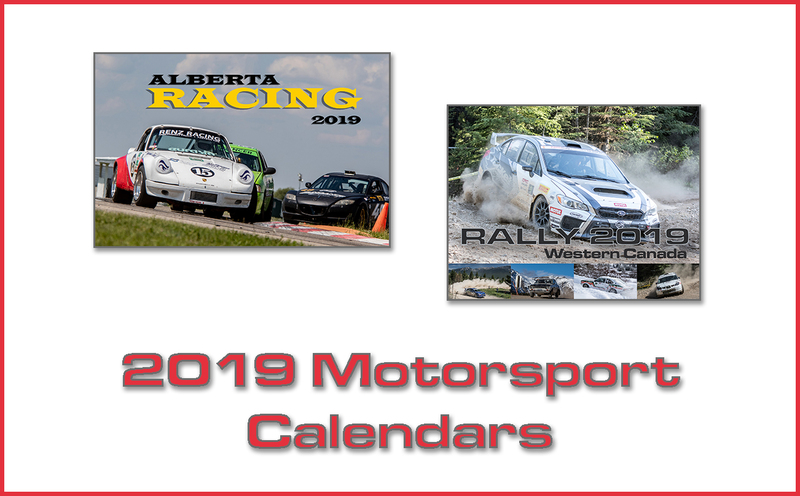 Lap Leaders: K. Harvick 1; Kyle Busch 2-23; K. Harvick 24-64; Kyle Busch 65-66; J. Johnson 67; D. Patrick 68-74; M. Truex Jr. 75-89; Kyle Busch 90-102; M. Truex Jr. 103; K. Harvick 104-106; M. Truex Jr. 107-176; P. Menard 177-178; M. Truex Jr. 179-248; J. Johnson 249-252; M. Truex Jr. 253-294; R. Stenhouse Jr. 295-296; D. Hamlin 297-306; Kyle Busch 307-329; M. Truex Jr. 330; Kyle Busch 331-333; M. Truex Jr. 334-367; Kurt Busch 368; J. Johnson 369-398; A. Dillon 399-400. 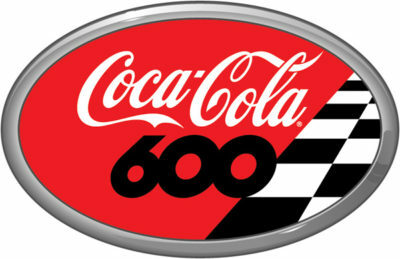 Leaders Summary (Driver, Times Lead, Laps Led): M. Truex Jr. 7 times for 233 laps; Kyle Busch 5 times for 63 laps; K. Harvick 3 times for 45 laps; J. Johnson 3 times for 35 laps; D. Hamlin 1 time for 10 laps; D. Patrick 1 time for 7 laps; R. Stenhouse Jr. 1 time for 2 laps; P. Menard 1 time for 2 laps; A. Dillon 1 time for 2 laps; Kurt Busch 1 time for 1 lap. (5/28/2000), Jamie McMurray (10/13/2002), Casey Mears (5/27/2007), David Reutimann (5/25/2009) and Austin Dillon (05/28/2017). Race Comments: Before the start of the event, the following cars dropped to the rear of the field under penalty for the reason indicated: Nos. 5 (rear gear changes) and 13 (unapproved tire change). Failed to Qualify: N/A. Caution Flags: 9 for 53 laps. Lead Changes: 23 among 10 drivers. 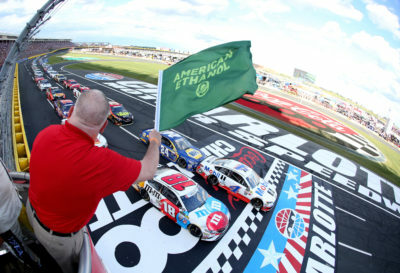 American Ethanol Green Flag Restart Award: Martin Truex Jr, #78. Ingersoll Rand Power Move: Austin Dillon, #3 10 positions. Mahle Clevite Engine Builder of the Race : Toyota Racing Development (TRD), #18. Mobil 1 Driver of the Race: Kyle Busch, #18. Moog Go the Extra Mile: Denny Hamlin, #11 0.070 sec. Sherwin-Williams Fastest Lap: Matt Kenseth, #20. Sunoco Rookie of the Race: Erik Jones, #77.